Wunderlist is a to-do list and task manager that can easily keep track of all the tasks and chores you have before you in your busy life. With Wunderlist apps available for just about any device, including Macs, iOS devices, Android, Windows, Kindle Fire, and of course, directly on the web, you can keep track of your tasks, as well as edit and update them from just about anywhere. Free and Pro versions available. Free version should meet the needs of individual or family users. Assign tasks and subtasks to multiple users. Supports reminders, notes, and setting due dates. Interface can be cumbersome, especially when digging for details. Wunderlist was just recently acquired by Microsoft, which can be a good or bad thing, depending on your point of view. And no, we don’t mean to say that being bought up by Microsoft is bad, only that when any large company buys a smaller one, there's a chance that the smaller company was purchased for specific technology or patents, and that its current products won't live on. That doesn't seem to be the case here, with Wunderlist planning support for additional devices, including the Apple Watch and additional Windows platforms. Wunderlist is a task list manager that keeps the task data stored in the cloud on the Wunderlist servers. This allows you to keep track of your tasks, projects, or to-do's across just about any devices you may be using; this is even true for devices that aren't directly supported by Wunderlist native apps. As long as your device uses a modern browser, you can access the web-based version of Wunderlist. To start using Wunderlist, you need to set up a free account. Wunderlist also supports a Pro version that offers additional capabilities, mostly in terms of how many people can access the same Wunderlist-based tasks and projects. We're going to review the free version since it will likely meet the needs of all but those in larger business groups. The free version allows you to assign tasks to up to 25 individuals, and create 25 subtasks. Tasks are also limited to relatively small storage space of 5 MB per task. The Pro version of Wunderlist, available for either a $5.00 per month or $50 per year subscription, removes the limits, allowing unlimited assignees, subtasks, and attachment storage space. Wunderlist starts by asking you to make use of one or more pre-configured lists that it provides. You can choose from Groceries, Movies to Watch, Travel, Work, Family, or Private. It’s a good idea to start off by picking a couple of examples. You can always remove these lists later, and trying out the premade versions is a great way to get acquainted with the Wunderlist app. 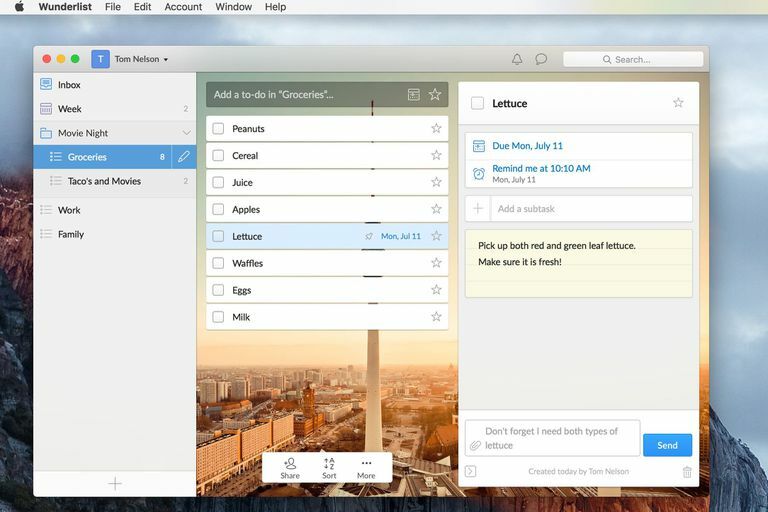 Wunderlist opens with a two-pane window, with your tasks and to-do’s shown in the left sidebar. The right-hand side shows items that are part of the selected list. As an example, our groceries list includes lettuce that we need for making tacos tomorrow. To-Do items you add to a list can also include due dates and notes, as well as a reminder set up to let you know when an item is needed, such as that lettuce we need by dinnertime tomorrow. The task lists in the sidebar are a way to organize a group of activities into one container. As an example, instead of just having a generic grocery list, we could create a task list named Tacos and Movie Night. The Tacos and Movie Night list could have multiple subtasks, including one that's a grocery list for what's needed for making the tacos, and a second subtask containing a list of movies and shows to watch. With Wunderlist, you can set times and dates for each task, as well as assign a task to someone. In the example above, making the tacos was a task we assigned to ourselves, while other parts of the great Tacos and Movie Night tasks were assigned to others. As each person completed their task, they updated the Wunderlist app to show the current status. It was only then that we realized we forgot to get peppers and tomatoes for making salsa. While my example may not be the best, it does give you an idea of what you can do with Wunderlist. With each task, you can add users (anyone with a Wunderlist account), assign responsibility for individual tasks, create due dates, set up reminders, add documents for others to view, and prioritize items. Wunderlist is by far one of the easiest task lists to set up and manage, especially for small groups and families. The ability to both assign a task and share the task details via Wunderlist makes it easy for everyone to remain up to date on the project, avoid delays, and in the case of the Tacos and Movies project, have a satisfying dinner while enjoying ​movie night. Wunderlist basic is free. The pro version is $5 a month or $50 per year. Clear Is a Terrific To Do App. Why Won't I Use It?